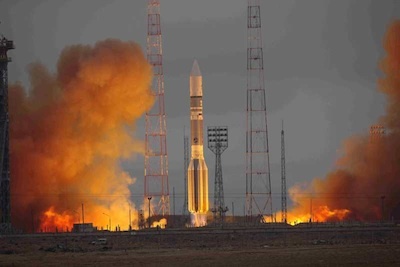 A commercial Proton rocket, topped with a Breeze M upper stage, lifted off from Kazakhstan Sunday and delivered an Intelsat communications satellite to orbit 23,000 miles from Earth. The marathon flight lasted nine-and-a-half hours, included four ignitions of the Breeze M upper stage, and ended with the successful deployment of Intelsat 23, a 5,910-pound satellite designed to enhance C-band and Ku-band service over the Americas, Europe and Africa. The 184-foot-tall Proton launcher took off at 0837 GMT (4:37 a.m. EDT) from the Baikonur Cosmodrome and quickly disappeared into an overcast sky. The three-stage Proton worked as designed, and the Breeze M stage maneuvered Intelsat 23 directly in a near-geostationary orbit about 23,000 miles high. Separation of Intelsat 23 occurred at 1807 GMT (2:07 p.m. EDT), and Intelsat confirmed controllers have acquired the first radio signals from the satellite. Sunday's success was the first flight of a Proton/Breeze M since an Aug. 6 upper stage failure placed Indonesian and Russian communications satellites in the wrong orbit. Investigators found a pressurization system component in the Breeze M upper stage was at fault in the mishap, and top Russian government officials ordered a shakeup of the Russian space industry, forcing the resignation of the head of Khrunichev, the builder of the Proton and Breeze M vehicles. While long-term reforms are just getting started, corrective actions allowed the Intelsat 23 launch to go forward. The launch of Intelsat 23 was arranged by International Launch Services, the U.S.-based firm which markets commercial Proton missions. Intelsat 23 will replace Intelsat 707, an aging satellite launched in 1996. The new satellite carries 15 active Ku-band and 24 active C-band transponders, and from a position at 53 degrees west longitude in geostationary, the craft will reach customers in the Americas, the Caribbean, Western Europe, Africa, and islands in the Atlantic and Pacific. 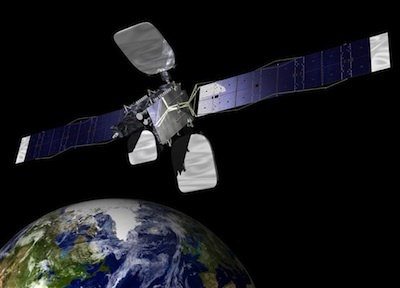 Artist's concept of the Intelsat 23 satellite. Credit: Orbital Sciences Corp. Built by Orbital Sciences Corp. of Dulles, Va., Intelsat 23 is designed for a lifetime of more than 18 years, according to Intelsat of Luxembourg, the world's largest communications satellite operator. "Intelsat 23 will refresh satellite capacity across four continents, offering critical services to the world's leading communications providers," said David McGlade, Intelsat's CEO. "This launch continues our current fleet replacement and expansion campaign, which is scheduled for completion in early 2013." Because the Breeze M was able to place Intelsat 23 directly into a circular near-geostationary orbit, the spacecraft will not need to use on-board propellant to raise its altitude. Most communications satellites are released by their launchers in oval-shaped transfer orbits requiring more burns to reach operational altitude. According to McGlade, Intelsat 23 has enough fuel for 27 years of operations, thanks to the launch profile. "It is an honor to celebrate our landmark 75th commercial launch with Intelsat with the successful launch of the Intelsat 23 satellite," said Frank McKenna, president of ILS. "The performance of the ILS Proton vehicle for this near-geostationary orbit mission will provide expanded lifetime for the Intelsat 23 satellite. We are pleased to enable the expansion of Intelsat’s fleet and support its plans for continued growth." Next up for the Proton rocket family is a Nov. 2 launch of the Luch 5B data relay satellite for Roscosmos and the Yamal 300K communications payload for Gazprom Space Systems. Another ILS Proton mission is set for Nov. 20 with the EchoStar 16 satellite to serve DISH Network television customers in the United States.